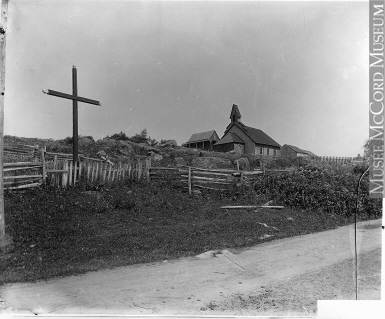 The English speaking summer residents of Charlevoix, including Cap à l’Aigle and Murray Bay have a long and strong tradition of worshiping God on Sundays and saints days. In addition to the Anglican community that has worshiped at St. Peter’s since 1872, the Murray Bay Protestant Church has held services for summer residents since 1867 in Pointe au Pic. This congregation held Anglican and Presbyterian services on alternate Sunday mornings and afternoons. Rev. Dr. A.B. Mackay was instrumental in fostering this practice at Murray Bay. In 1889 he initiated the construction of in a small protestant chapel on the east end of Cap à l’Aigle, just below where “the Eagle” now nests at the junction of the Rte 138 and rue St. Raphael. Due to the decline of English summer residents, the Mackay family decided to dismantle the building. The furnishings including the lectern, and some pews, and the stained glass window depicting the Burning Bush were given to the église evangelique in Port au Persil. The Memorial Plaques and the balance of funds realized from the sale of the property were given to St. Peter-on-the-Rock. The Presbyterians and non-Anglicans have been afforded a most hearty welcome and all worship together each Sunday throughout the summer. Thus the hope that Dr. A.B. Mackay had at the time he built the church that all Protestants should worship together has been realized.